Pinterest has joined other websites in updating users regarding potential Heartbleed bug security issues in an email sent to users today. They report no suspicious activity has been detected and the problem has been patched, however they urge users to change their passwords as an added step in security. 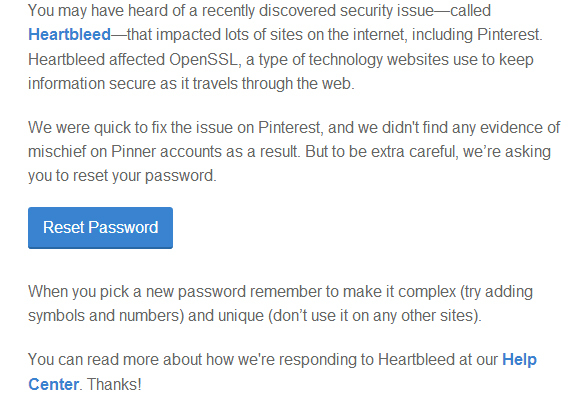 An email to Pinterest users today informed that the Heartbleed bug has been patched and while there is no indication of unusual account activity, it is suggested that users change their passwords. Earlier this week, it was reported that a massive security flaw had been discovered in encryption software used by nearly 70% of websites. Although the discovery was made just this week, it has been reported that this issue has existed for more than two years, leaving presumed secure sites vulnerable to unwanted access to personal information. It is unclear at this point who may have accessed any information through this vulnerability, but websites have been checking their systems for the bug and patching to repair the problem. While it is a good practice to change your passwords regularly, unless a website has patched their vulnerability, changing your password will not protect your information. CNET is keeping an updated list of the 100 top websites and their Heartbleed status. Click here to check the status.